Will this Crude Oil Price Rally hold? Crude has finally reversed higher to recover some of its recent losses, and is now showing clear evidence of a new Daily Cycle (DC) and Crude Oil Rally. There are early signs of a new Investor Cycle (IC) as well. Midweek, Crude bottomed on day 44 before reversing sharply higher and punching through the declining trend-line. And when it closed above the 10 day moving average, Crude confirmed that it is in the early stages of a new Daily Cycle. 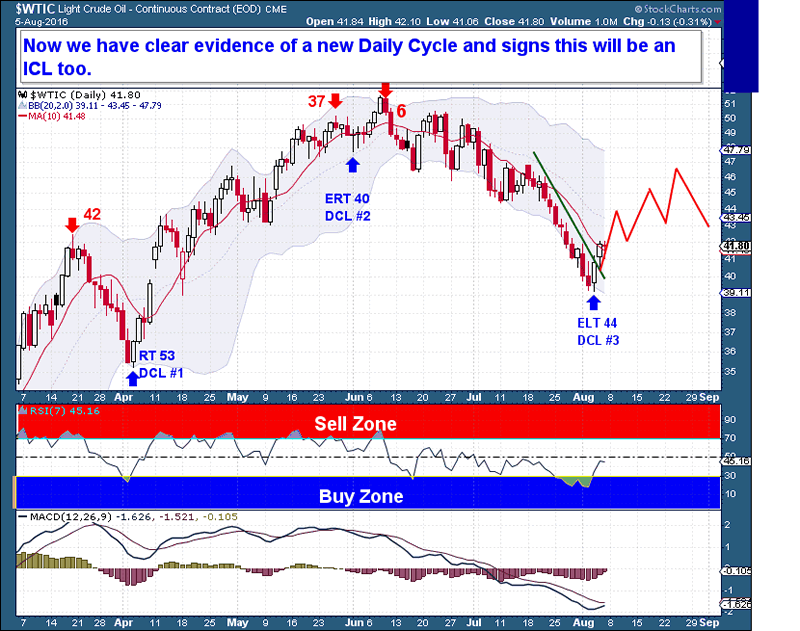 From this point forward, Crude’s performance will depend on its Investor Cycle and the bear market as a whole. In terms of sentiment, there was enough of a selloff to suggest that an ICL occurred. 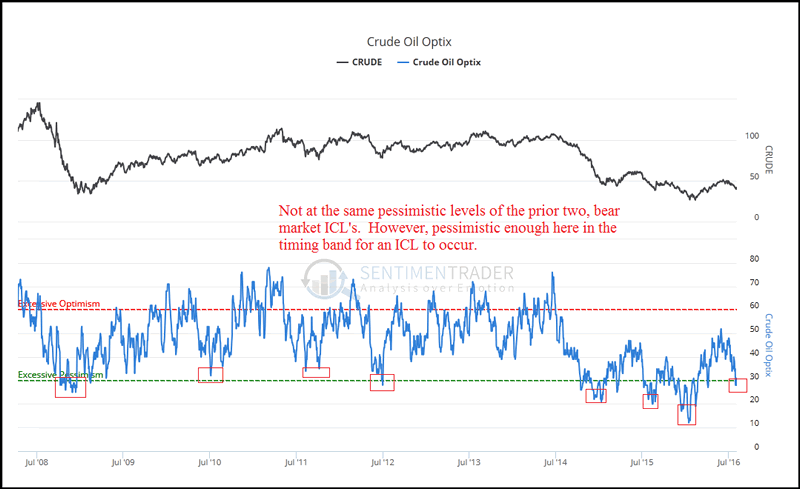 Even though pessimism did not drop to the level of the previous 2 bear market ICLs, it was more than adequate for an ICL, especially with the weekly Cycle extended beyond its normal timing band. 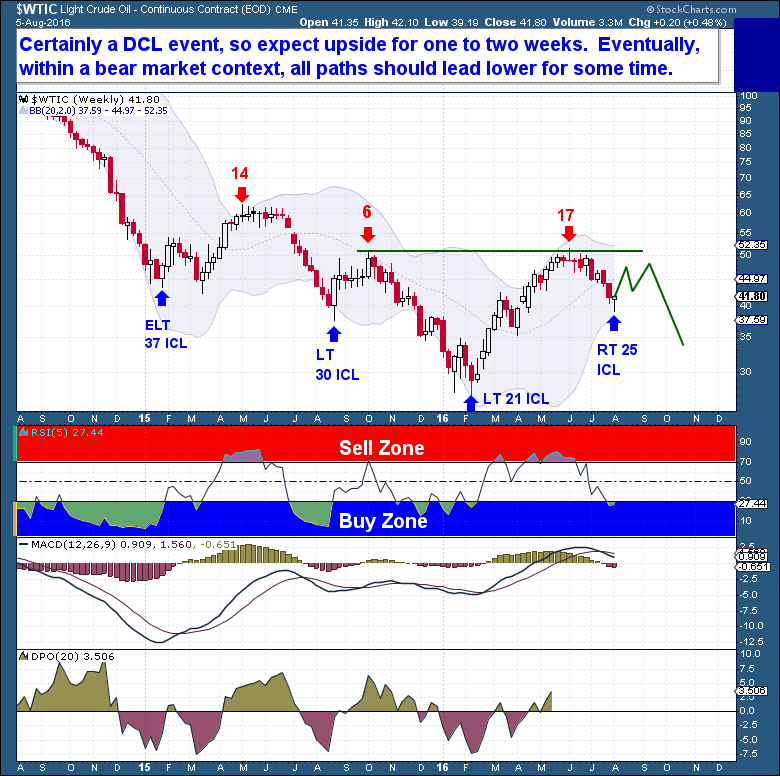 At the very least, Crude has seen a DCL, so we should expect at least 1-2 weeks of upside. Eventually however, given that Crude is in a bear market with a series of lower ICs in play, all paths should lead lower. And that should continue for some time to come. NOTE: The Financial Tap offers you a Full 14 day, no risk, money back Trial. It’s just $99 thereafter for a full 3 months of membership, a fraction of what one stopped out trade is likely to cost you. Consider joining The Financial Tap and receive two reports per week and the education you need to become a better trader or investor See >> SIGN UP PAGE!